DIGITAL READING COMPREHENSION PROGRAM TO IMPROVE LITERACY SKILLS. provides diagnostic assessments and guided instructional lessons, while also granting teachers access to detailed reports on their students’ progress throughout the program. that learning to read is a fundamental right. Every child deserves access to the skills of understanding, interpreting and navigating the increasingly complex world they live in. We believe that the presence of useful data is important in pinpointing the best way to help students achieve. Our reports are detailed yet simple and understandable so that any areas of concern can be acknowledged directly, not hidden behind a tiring string of numbers. Easily accessible and understandable reports that provide valuable performance diagnosis. Get a live view of each student’s activities in the classroom through your screen. Our program saves time by automatically marks and grades students once tasks are completed. View how students perform in relation to each other in order to determine how to help those that need it most. Our adaptive placement test allows students to begin from a suitable reading level they are comfortable with. Our program contains engaging narratives with coloured illustrations that make reading an adventure, not a task. Students can explore and uncover the reasons which make a correct answer right, and an incorrect answer wrong. Provide suggestions on what to do next so students can continue to learn at their own pace, in their own time. 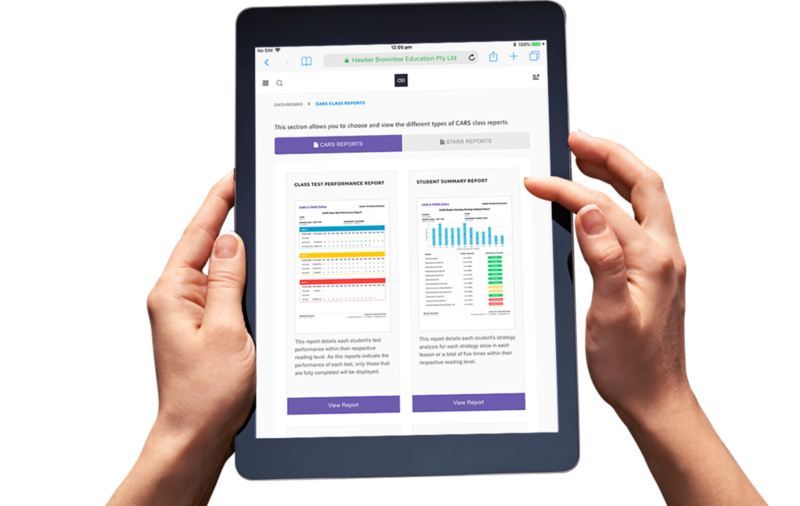 View your class’s progress for assessment and activities, or pull up a detailed report for an individual student. Focus on the things that really matter. Nurture the limitless potential of your students with your newfound spare time instead of marking ticks and crosses all day. CARS & STARS Online is designed with an intricate algorithm that can mark your students’ work for you, giving instant feedback and rewards as students excel through our program. Get a comprehensive live view of each student’s activities in the classroom! Technology can be a teacher’s best friend, but it can also be a teacher’s worst enemy. As helpful as it can be, we know all too well how distracting technology can be for young minds. So we’ve integrated the ability for teachers to view and monitor the activities of each student in the classroom from their own device through a live view of their screens. Sign up now for free and experience a full 30 days with all of our exclusive features and benefits. All data and progress will be kept safe for you if you choose to continue with the program, allowing you to smoothly transition into one of our premium options.